Ronda Rousey has been offered an opportunity to become a “Paul Heyman girl”. Former UFC women’s bantamweight champion Ronda Rousey (12-2) is indeed on demand. Although the future of her fighting career is unclear, she is certainly involved in action. Earlier this month Rousey made headlines with her appearance in the Blindspot Episode 20. The most recent is the talks about her possible career in the WWE. Famed American entertainer Paul Heyman joined the Fight Society podcast on Tuesday. He spoke Brock Lesnar, Ronda Rousey as well as previewed the WrestleMania 33. In regards to female MMA star, the WWE manager expressed no doubts in her success if she joins the show. Rousey was riding the 12-fight undefeated streak in MMA. She defended her UFC bantamweight title six times. In the seventh defense in 2015 she suffered a knockout defeat in Round 2 against Holly Holm. In her 2016 comeback fight she similarly lost by KO against Amanda Nunes in Round 1. “I’d love to see it and would be happy to discuss with her all of the benefits that she could inure by being a Paul Heyman girl”. 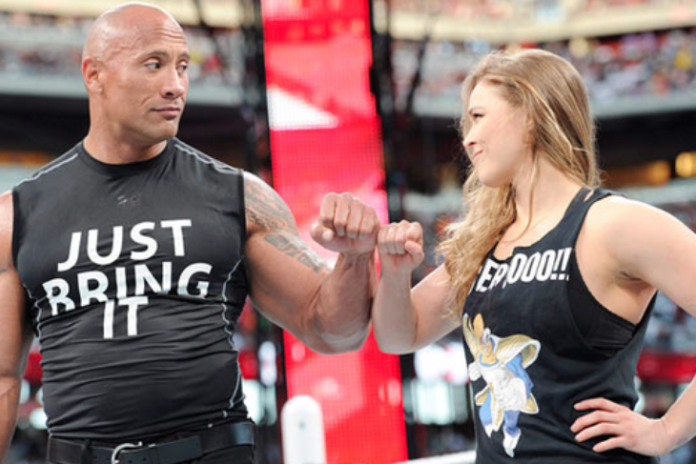 In 2015, shoulder to shoulder with “The Rock” Dwayne Johnson, Rousey appeared inside the ring at WrestleMania 31. She clashed with Stephanie McMahon and Triple H.
In addition, Heyman gives several names who in his opinion are capable to form an opposition for the 2015 Rolling Stone’s world’s most dangerous woman. As well, to make plenty of money. “I would personally pay to see Charlotte versus Ronda Rousey. I would personally pay to see Stephanie McMahon versus Ronda Rousey for a completely different reason but why digress,” he says. “It’s not like Charlotte is the only one who could be paired up with Ronda Rousey. There are others as well.